The newly-appointed Deputy Vice-Chancellor, Academic of the Federal University of Agriculture, Abeokuta, Professor Mufutau Adekojo Waheed, has assumed duty. Professor Felix Kolawole Salako, Deputy Vice-Chancellor, Development who was re-appointed, has also resumed. Governing Council of the University recently approved the appointments of the Deputy Vice-Chancellors for the University. According to the Registrar, Mr Matthew Ayoola, the appointments, which were on the recommendations of the Senate are for a period of two years each, effective from January 1, 2014. Until their appointments, Professor Waheed was the Director of Academic Planning, while Professor Salako was re-appointed as Deputy Vice-Chancellor, (Development) of the University. The DVC, Academic, a Professor of Thermofluids in the Department of Mechanical Engineering, College of Engineering, is from Ogbomoso, Oyo State. He attended the Ajaawa Baptist Grammar School, between 1978 and 1983, and the University of Ilorin, where he obtained his B.Eng (Hons) and M.Eng degrees in Mechanical Engineering in 1990 and 1995, respectively. He then proceeded to the Aachen University of Technology, Germany and bagged a Doctor of Engineering Science Degree in Mechanical Engineering, in 2001. Professor Waheed had worked in several capacities at the Ladoke Akintola University of Technology, Ogbomoso, from 1992, as a Graduate Assistant and rose through the ranks to become a Professor in 2008, before he joined FUNAAB the same year. Since joining the University, he had served at various levels including Head, Department of Mechanical Engineering; Member, Postgraduate Board; Deputy Dean, College of Engineering; member, Committee on National Institutional Ranking as well as Committee on the Preparation of Proposal for Community Radio and Internet Radio Station. He has to his credit, over 80 publications in books/monographs, articles, conference abstracts and proceedings in reputable journals; had supervised about 50 Master’s and Doctorate Degree students and had also been an external examiner to several Universities. The DVC, Academic, who belongs many professional bodies such as the Nigerian Society of Engineers and the Council for the Regulation of Engineering Practice in Nigeria, had attended and presented papers at several local and international conferences and academic fora. Professor Waheed had been conferred with several awards such as University Scholar as the Best Graduating Student in Mechanical Engineering, University of Ilorin (1987 – 1990), among others. 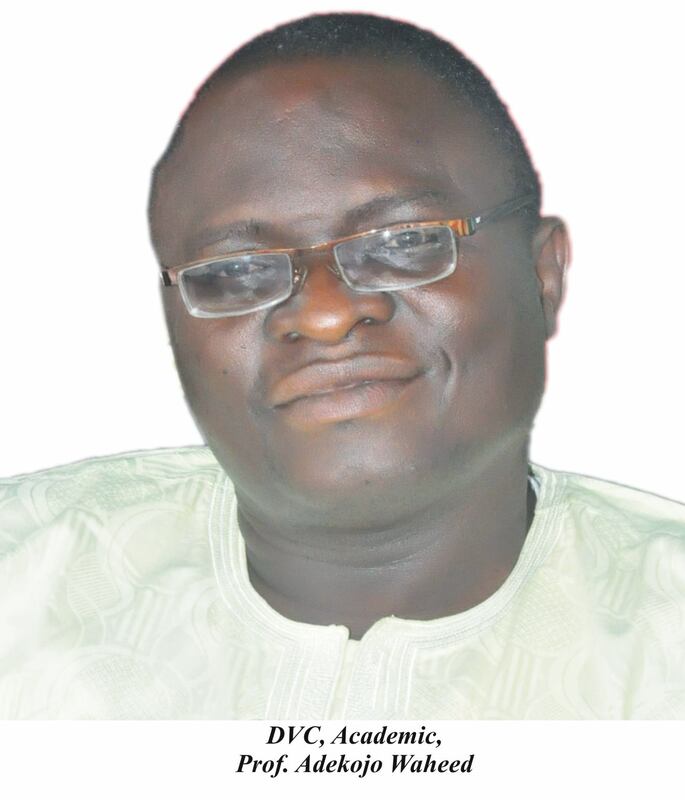 The Deputy Vice-Chancellor, Development, Professor Felix Kolawole Salako is from Ibadan in Oyo State. A Professor of Soil Physics in the Department of Soil Science and Land Management, College of Plant Science and Crop Production, Professor Salako attended the Igbobi College, Lagos; the University of Nigeria, Nsukka, where he obtained his B. Agric (Hons) and M.Sc degrees in Soil Science in 1983 and 1986, respectively before proceeding to the University of Ibadan, where he bagged his PhD Degree in Soil Science, in 1997. Professor Salako joined the services of FUNAAB in 2000 as a Senior Lecturer and moved up the academic ladder to become a Professor in 2006. 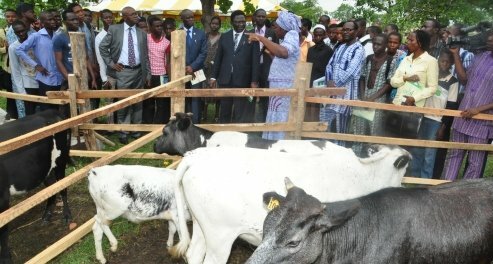 He had served the University on many fronts, which include: Head of Department, Soil Science and Land Management; Director, Agricultural Media Resources and Extension Centre; Pioneer Director, Centre for Community-Based Farming Scheme and Deputy Vice-Chancellor, Development, from 2011 to date. He has to his credit, over 80 publications in books/monographs, articles in learned journals, papers in referred conference proceedings and technical reports. He had supervised more than 40 students at both the undergraduate and postgraduate levels, in addition to being external examiner to several Universities. 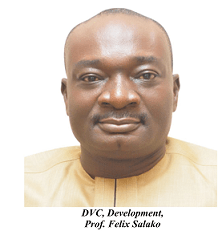 Professor Salako belongs to a number of professional associations and learned societies such as the Soil Science Society of Nigeria; Agricultural Society of Nigeria; Soil and Water Conservation Society, United States of America and had delivered papers at many local and international conferences, seminars and workshops. Notable academic laurels won by him include the Best Student Prize in Soil Science (1982 – 1983) Graduating Set of the University of Nigeria, Nsukka, the Marquis’ Who-is-Who in Science and Engineering (8th Edition) and Chief War Marshall, Man ‘O’ War Club of Nigeria. Professor Salako, a Jerusalem Pilgrim, was honoured with the chieftaincy titles of the Asoludero of Iwoye-Ketu and the Bobatolu of Isaga-Orile, Ogun State, in recognition of his immense contributions to the development of the two communities. 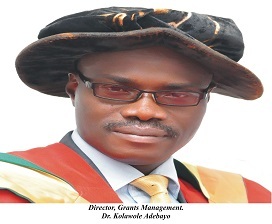 In a similar vein, the Vice-Chancellor, Professor Olusola Oyewole, has approved the appointment of Dr. Kolawole Adebayo, Deputy Dean and Reader in the Department of Agricultural Extension and Rural Development as the new the Director of Grants Management. Dr Adebayo, a native of Ode-Remo in Ogun State, attended the Ayodele Samuel Memorial School, Molete, Ibadan (1972 – 1978); Ode-Remo High School, Ode-Remo (1978 – 1982); Oke-‘Badan High School, Ibadan (1982 – 1983); and the University of Ife School of Agriculture, Akure (1984 – 1986). He obtained a First Class Degree in Bachelor of Agriculture (1994), Master’s of Agriculture (1998) and Doctor of Philosophy (2002), in Agricultural Extension and Rural Development from the Federal University of Agriculture, Abeokuta. 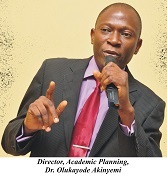 Dr Adebayo joined the services of FUNAAB in 1995, as a Graduate Assistant and rose steadily to become a Reader. He has to his credit, over 50 publications as journal articles, books and technical reports and had supervised about 20 undergraduate and postgraduate students to date. The Director of Grants Management had served the University in various capacities, including the Departmental Postgraduate Coordinator; Deputy Dean, Student’ Affairs; and Chairman, Management Committee on Transportation. He was also Secretary and later, Vice-Chairman, Academic Staff Union of Universities, FUNAAB Branch as well as the pioneer National President of the FUNAAB Alumni Association. He has won many laurels such as the Vice-Chancellor’s Honour, Best All-Round Graduating Student Award; Federal Government Postgraduate Scholarship; and the World Bank Development Marketplace Winner. Dr Adebayo is a member of the Nigerian Rural Sociological Association; member, International Society for Tropical Root Crops; member, Ecological Science of Nigeria and , the Project Manager, Cassava: Adding Value for Africa (C:AVA), Natural Resources Institute, University of Greenwich, United Kingdom.